i Click 'view all' to instantly compare this fantastic deal with offers on other top manual can openers. 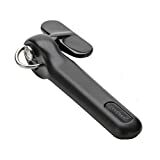 YIBAI Stainless Steel Can & Bottle Opener & 2 Spare Carbon-Steel Blades is currently selling at $15.57, approximately $0.61 lower than average, giving a potential saving of $1.00 right now. With a lowest price of $15.57 and an average of $16.18 it is selling on the low end of its usual range. Price volatility is 0.3% (meaning it does not change often), so the price should stay low for a while. Right now this product is a recommended 'fantastic deal'. The current deal is also the best price on this item over the last month. Compare the current price, savings (in dollars & percent) and Buy Ratings for the top Manual Can Openers that are closely related to YIBAI Stainless Steel Can & Bottle Opener & 2 Spare Carbon-Steel Blades. Here is how YIBAI Stainless Steel Can & Bottle Opener & 2 Spare Carbon-Steel Blades compares with other leading Manual Can Openers. YBIAI stainless-steel manual can opener is ideal for home kitchens, restaurants, hotels, bars, camping, barbecue parties and outdoor picnics. Features: *Can opener adopts high quality 304 stainless-steel and food-grade materials. *Three-in-one multi-function can opener is suitable for all sizes of cans, and it can also serve as bottle opener and lever. 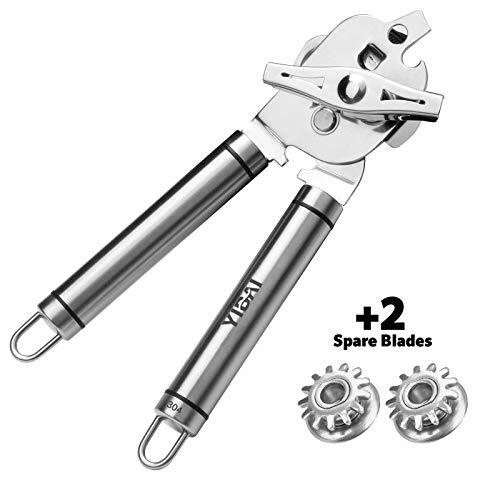 *The manual can opener heavy-duty stainless-steel blade ensures easy opening of cans. 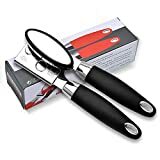 *Cutting mechanism on manual side will provide a smooth edge to ensure your hands are completely safe and the ergonomic grip provides you with extra strength. Professional design with enhanced stainless-steel and double hooks make it a perfect kitchen gift. *2 spare ultra-sharp blades to maintain long-lasting performance. Instructions: Step 1: Place the metal teeth (wedge) on the can edge. Step 2: Turn the handle of manual can opener. Step 3: Move along the edge of the can while turning the handle. Package: 1x manual can opener 2x spare blades Notes: Do not open the can lid completely in case it will fall on the food. Multifunction: The can opener can be used for tin can, oil can,milk can, metal can, bear can, aluminum can, big can, small can, round can, square can, water bottle, food can for cats and dogs, jar, etc. Features?HIGH QUALITY?Made of high quality 18/8 food-grade stainless-steel, it won't rust or break when used. The cutting blades are heat treated and galvanized for durability. It can easily pierce and open various types of cans. 2 replaceable blades allow extended service life. ?ERGONOMIC GRIP?Ideal for the elderly or users with joint issues. Ergonomically designed grip allows reliable holding force and large knob ensures easy rotation. ?MULTI FUNCTION?3 in 1 multifunctional can opener can serve as can opener, cover lifter and bottle opener. It will become your most trusted and most convenient kitchen companion. ?EASY TO CLEAN?Hand wash with lukewarm water and mild detergent?rinse immediately and hang to dry.